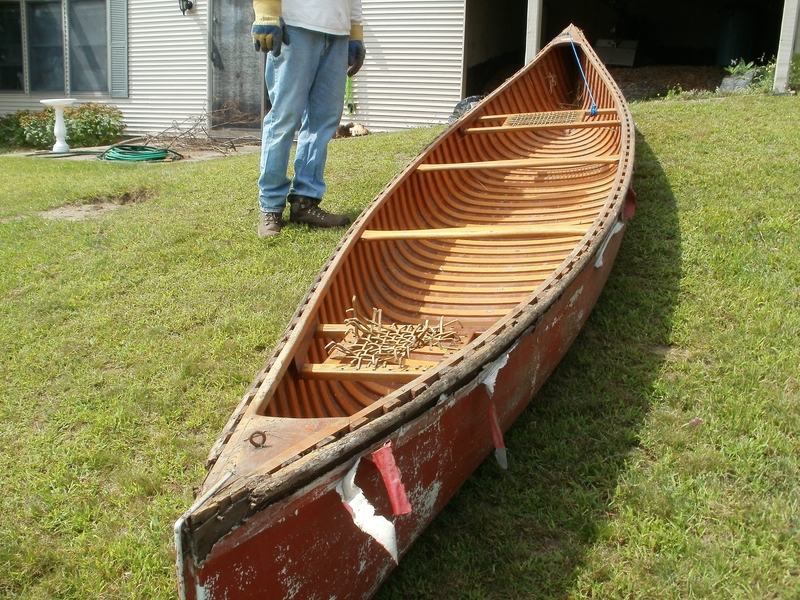 The vintage canoe that once belonged to the late John Zale is being repaired and restored and will be donated to the Boy Scouts of the Greater Niagara Frontier Council. The council’s leaders said they will display the canoe as part of the organization’s local history. John Zale spent some of the worst moments of his life on board a boat. He also spent some of the best there. Which is why – when his family dedicates Zale’s old wooden canoe in his memory later this spring and donates the vessel to the Boy Scouts – it will be a tribute entirely fitting. Zale, who died in 2012 at 90, loved to go out in the “Tamarack” in the waters around Buffalo with his wife and kids, to take in the sights and paddle around. He found a measure of peace out there. It was something Zale badly needed – given the experiences of his early life. Zale, who started life as John Zubrzycki, spent 3z years during World War II as a prisoner of the Japanese. He suffered in ways that are almost beyond imagination. “Every day, during that time, there was no guarantee you’d see the next,” said Allen Zale, his son. Now, as the Zale family prepares to pass on their father’s beloved canoe to the Scouts, it is a time for those who knew Zale to remember him – and what he went through. He also is being remembered for his service after the war as a Scout leader. Some who knew Zale in the organization said they still feel his influence on their lives, even so many years later. “I carry that with me to this day,” said Richard C. Kloch, a former Scout who is a State Supreme Court justice. Zale became for many an example of survival. John Zubrzycki was born in Lackawanna in 1922, to a family that had to struggle to get by. His father, Peter, was a laborer, and his mother, the former Sophia Zdyb, ran the house. Besides John, there was Marion, the second son, and Frances, the youngest. During the Depression, Sophia helped make ends meet by running a small candy store out of their First Ward home. Zale had many jobs to do, including taking care of the rabbits the family raised and scrounging for fuel to keep them all warm. John’s education ended at sixth grade. He would later spend lots of time in libraries, filling that gap. “He really educated himself,” recalled Marion Zubrzycki, 88, who lives in Lackawanna with his wife of 46 years, Rita. Zubrzycki joined the Army at 18, in February 1940. He was sent to the Philippines, as part of the 31st Infantry. Much later, Zale would joke that he ended up in the “furthest place they had.” Then the war started, in 1941, with the attack on Pearl Harbor. Zale was in danger. He was wounded when he was struck by a Japanese bullet or shrapnel, and needed surgery – which in itself was risky. But worse was to come. He became a prisoner of war, along with thousands of other American soldiers, after the Battle of Bataan. The battle ended with the surrender of some 12,000 U.S. troops – who had been holding out for months – to the Japanese, along with thousands of Filipino soldiers. Zale was forced into the Bataan Death March, a journey of more than 60 miles across the Bataan peninsula. The march was devastatingly cruel. The POWs were given little or no food and water, and were forced to march in extreme heat. Many were killed along the route or died from the harsh conditions. They were starving and sick. Zale later said surviving the march took every ounce of his stamina. He was put in a prison camp, Cabanatuan. Then he was loaded onto a Japanese ship for transport from Manila to Korea. He ended up in a prison in Manchuria called Mukden. The “hell ships,” Zale would later say, were worse than the death march. Prisoners were packed in, covered with lice, unable to use any toilets and given practically nothing in the way of nourishment. Zale was fighting for his life during these days. He was sick, with diseases including malaria. His weight dropped into the range of 96 pounds. Jan Thompson, a professor at Southern Illinois University who has produced documentaries on Bataan Death March survivors, said that men like Zale have stories that are all different – but all terrible. “Each one of these guys had their own story of survival,” said Thompson. His imprisonment would last 3z years, until he was freed in the summer of 1945. After what he went through, it would be easy to understand if he never wanted to be in another boat for as long as he lived. Zale came home at age 23 and resumed his life in Western New York. In 1947, he got married. With his wife, Stella, he raised two children, Allen and Karen, while working at Bethlehem Steel and as a maintenance man for Army bases. Stella Zale died in 1995. Around the time his first child was born, Zubrzycki changed his name to Zale. The Zale family moved to North Tonawanda in 1956. That’s where Zale served as a leader of the Boy Scout Troop 192 – a position he held for many years. He was a different sort of leader, Zale’s former Scouts said. For one thing, he was tough and exacting in his standards. For another, he stressed life skills and survival techniques – even using old military training films to drive home his points. One day with Zale stands out, in particular, for a former Scout. It was Nov. 22, 1963. President Kennedy had been assassinated that day, and the people associated with Troop 192 were reeling, along with the rest of the country. “My mom put in a call to Mr. Zale, and he said, ‘No, we’re going on as usual,’ ” Kloch said. “We went on with that meeting. There was nothing – no mention of it. We got in a row, we had uniform inspection,” he said. “All he had to say was, ‘Didn’t we learn enough today about duty and sacrifice, that you can’t stand at attention for an hour and a half?’ ” Kloch said, of Zale. Kloch said the lesson he absorbed that day was simple. Now, Zale’s family members said they want others to know about his life. “It’s time,” said Karen Zale, his daughter. They have put Zale’s old wooden canoe into the care of a New Hampshire boatbuilder, Kevin Martin, who is repairing and restoring the vintage craft. Some of Zale’s former Scouts chipped in with money to help pay for the refurbishment project, the Zale family said. “This was just an inspiration,” said Karen Zale. At the Boy Scouts of the Greater Niagara Frontier Council, leaders said they are looking forward to taking possession of the canoe. They said they will display it as part of the organization’s history in the Buffalo area. “Mr. Zale came back, and he just turned such a horrible experience into such a positive experience for kids,” said Russell Etzenhouser, executive director of the local council. The canoe, he said, will give future scouts a glimpse at the life of someone who survived a great deal – and then carried on.